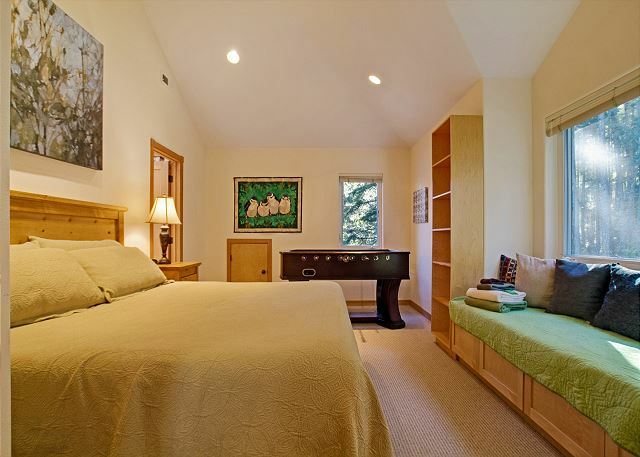 Upper level bedroom with king size bed and attached bath. Stonecliff - WATERFRONT! HOT TUB! * 15 ACRES OF TRAILS! 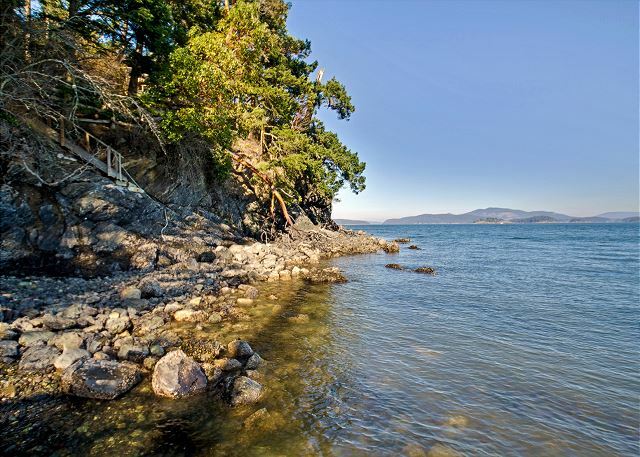 Stonecliff offers the peaceful tranquility that you are looking for on San Juan Island. Enjoy the beautiful San Juan Channel water views from nearly every room of this spacious custom home. The detailed river rock fireplace complements the comfortable living room complete with a large television including satellite service and sofa sleeper for those needing the extra space. 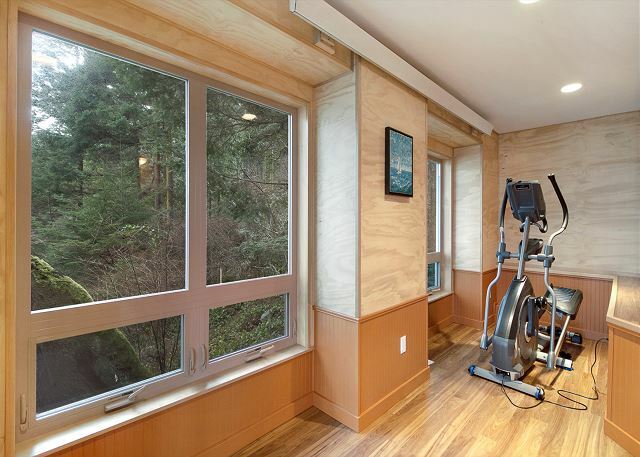 There is also a small finished area underneath the house with an elliptical machine for guests wanting to keep up on their workout routines. Enjoy preparing your meals in the fully equipped kitchen that looks out to the dining room with seating for 8 as well as catching a glimpse of the passing ferry while cooking and visiting with family and friends. 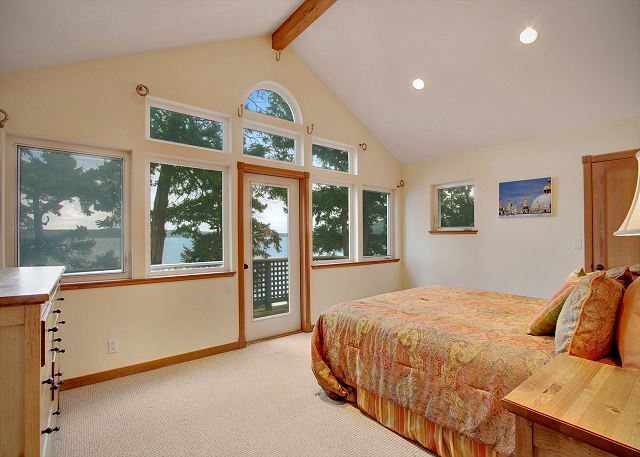 The master suite has beautiful views out to the water as well as access out to the deck. The room is furnished with a king size bed and has a spacious master bath with dual sinks, a corner soaking tub and an oversized tiled shower. 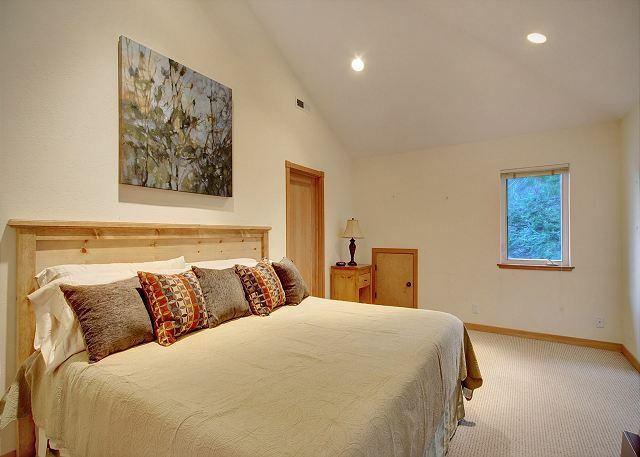 The two upstairs bedrooms are both furnished with king sized beds and have open, vaulted ceilings. One bedroom offers breathtaking waterviews and a private balcony. The second bedroom is nicely appointed and offers direct access to the upstairs full bathroom complete with dual sinks and oversized tub/shower with tiled surround. Relax on the wonderful waterside deck or in the hot tub (Hot tub available at no charge Memorial Day Weekend through December. From January until Memorial Day Weekend the hot tub can be made available for a $100 fee per stay). In addition to the waterfront ambiance, feel free to walk the 15 acres of property with trails for you to explore some of the island's unique landscape. 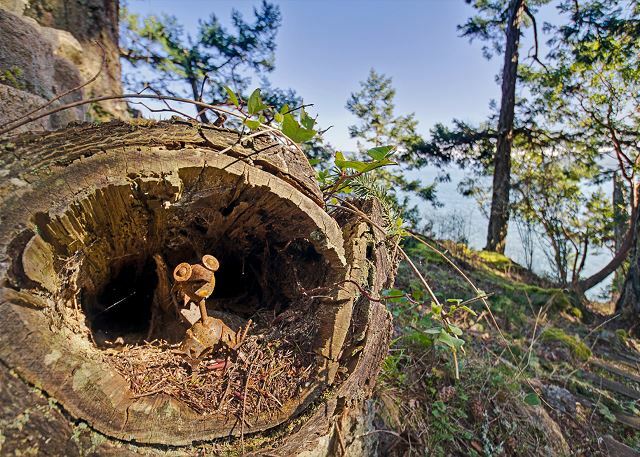 The owners have also designed a one-of-a-kind scavenger style “Critter Hunt” – a great activity to explore the property. 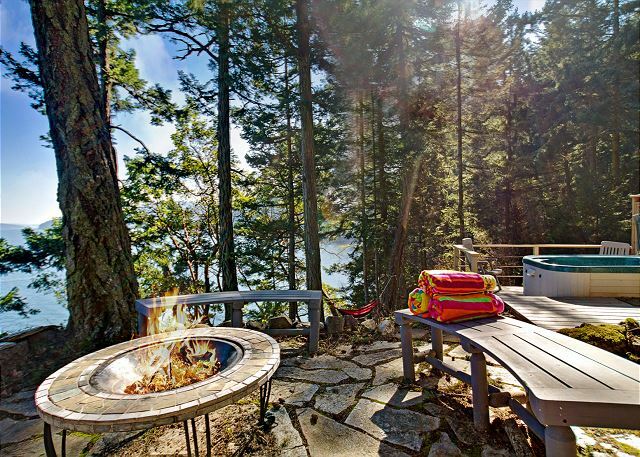 This amazing and private property provides guests with the feeling of seclusion yet is less than 5 miles from town! *Hot tub available at no charge Memorial Day Weekend through December. From January until Memorial Day Weekend the hot tub can be made available for a $100 fee per stay. My wife, sister, brother-in-law, son, and his fiancée celebrated my 75th birthday at Stonecliff. We thought that both the house and its setting were amazingly beautiful. We plan to return in two years to celebrate my 77th birthday. However, the photo to the right of this review is not entirely accurate. It should also show Mt. Baker in the background and a ferry passing by. Top notch vacation house. 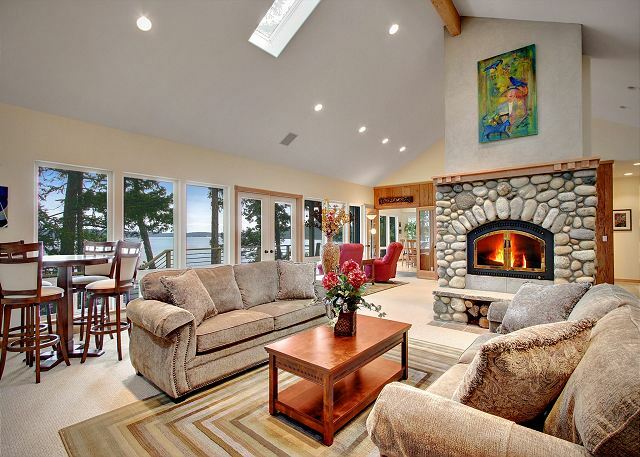 Terrific house, views and accommodations. 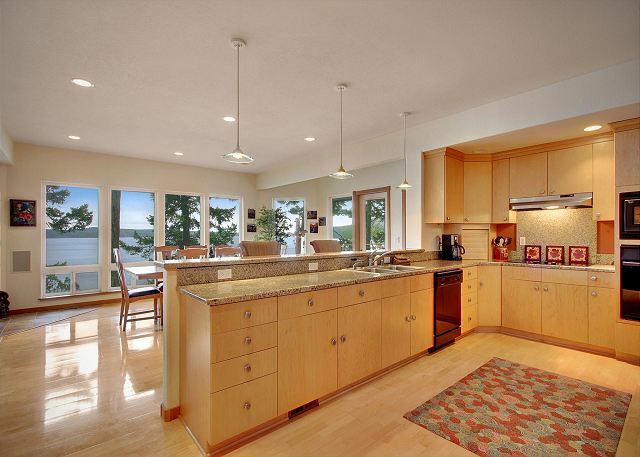 Very conveniently located to both Friday Harbor and Roche. Would recommend to anyone. not only is the property wonderful but San Juan Property Property Management is a FULL SERVICE realtor. If something needs to be fixed you just pick up the phone! Stone cliff house was absolutely beautiful, exactly as it was in the photos. We loved watching the bald eagles perch in the trees and deer stroll through the property. Home was well maintained and equipped. We used the fire pit every night to roast marshmallows. We thoroughly enjoyed our time here. 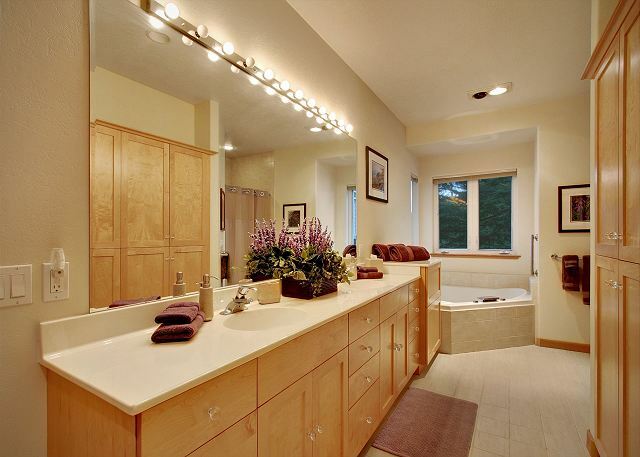 The house has an open layout, kitchen was well equipped, and master suite was huge. We enjoyed the hot tub and firepit. Great views from almost everywhere. The "Critter Hunt" was fun too. 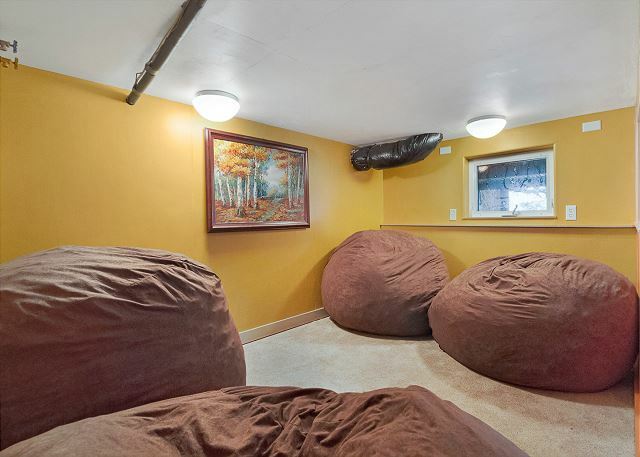 We highly recommend this property. San Juan Property Management was great too -- friendly, helpful, and called ahead to let us know the house was ready. Stonecliff had the perfect ocean front location and was spotless. 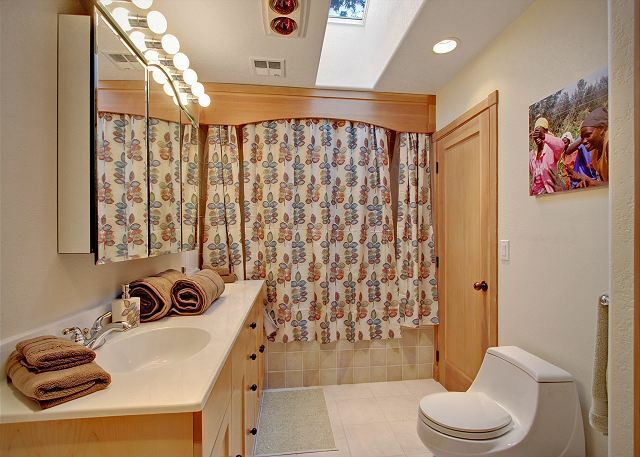 The layout was perfect for our group of five with privacy if desired. It was well equipped with anything one might need in the kitchen. The location was very private with wonderful trails for exploration. 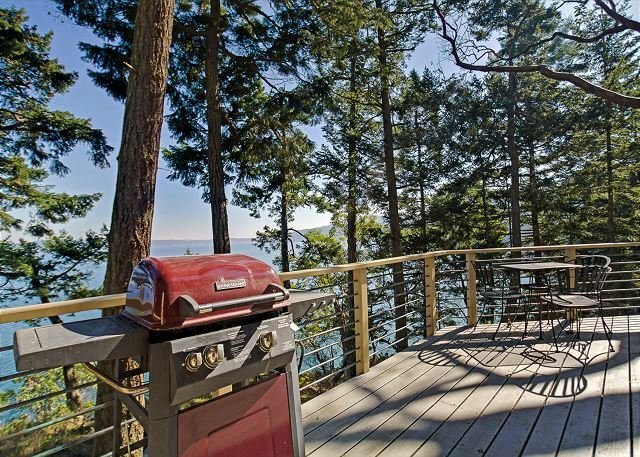 It was secluded yet close enough to Friday Harbor for meals and shopping. Check in was simple and I never had any need to contact San Juan Property Management as we had no problems! I highly recommended this rental and would stay here when I return. My husband and I rented this house for a long weekend get-away. 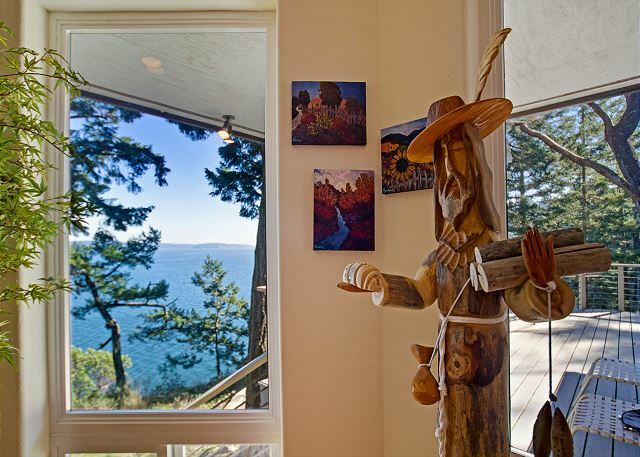 The location was great - Friday Harbor and Roche Harbor are both close. We enjoyed watching the boats on opening day of shrimp season. The bed was comfortable and the kitchen well stocked. We used the fire pit twice and the hot tub each day. Also loved all of the artwork scattered around the house and yard. 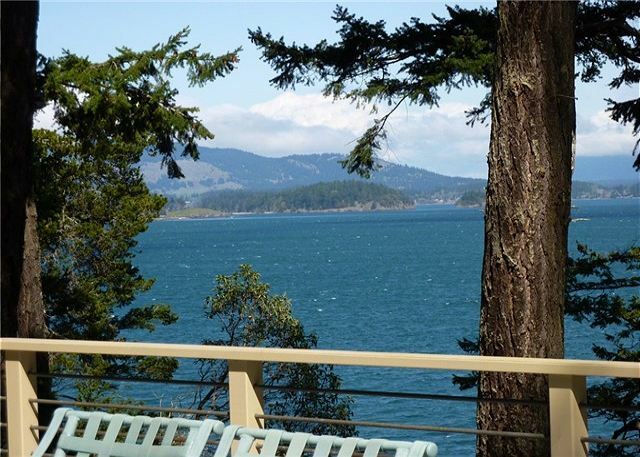 We rent houses or apartments whenever possible on our travels and this house on San Juan Island was the cleanest, lovliest, best location, most fun house we have ever stayed at. We have already told friends about it and we would love to return. It is a great house. Spacious, beautiful views, the property is beautiful and the owners have made it a very comfortable and fun place to be. The foos ball table was fun to play with, the low tide at the rocky beach was great. We saw a few sea lions swim by, and uncovered an eel under a rock at the beach. 5 stars all the way. We were very happy with our stay at Stonecliff. The house lives up to it's description and photos. Kitchen had pretty much everything we needed, views were amazing, and there was plenty of room to spread out and enjoy the house. The view from the hot tub was fantastic. One thing to note is that it only holds four people, which for most families and groups should not be a problem. Outdoor grill was clean and worked great. One thought would be to have instructions on the wood burning fireplace. We weren't able to figure out if the damper was open or not..... it doesn't have a chain, and we were worried about smoking out the house. The management company did offer to have someone come out to help, but since our stay was short we just went without the fire. On that note, the outdoor fireplace was great. One special treat for families is the trail system with the critter find scavenger hunt. The walk is beautiful and finding the critters was fun for the whole family. Place was clean with the exception of some popcorn under the coffee table. Excellent, Relaxing, Clean, and Stunning! The location and the house were everything I hoped they would be. I expected it to be a beautiful view but it was even better than I had envisioned. The beds were so comfortable, everything clean, patio is huge, property is stunning. I really have no complaints except the hot tub is a little smaller than average hot tubs. Still the tub was enjoyable and we all had a great time. Would definitely recommend staying here! 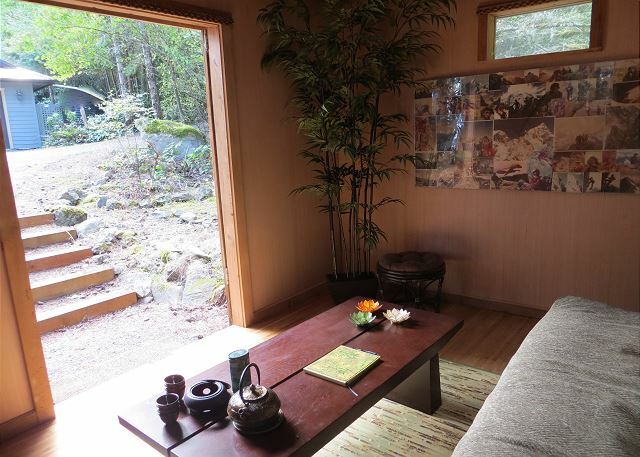 Great home, nicely appointed inside and out, artistic touches and a Tea house for the meditators. Very private and one of the best views on the island with the house sitting right above the water. 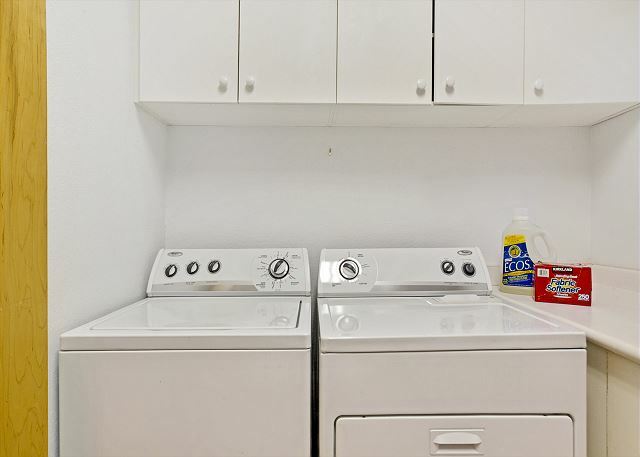 All the amenities you could want. Its own nature trail full of surprises and a stairway to the beach Even the deer are friendly. and the night critters frequent. Could not ask for more. Awesome experience! Would rent this property again! This was our 4th consecutive year to stay at this property, what more can one say other than superb! My family and I had a memorable vacation at Cliff house. The house was spacious and comfy for all of us. The view was so beautiful and we could enjoy it from nearly every part of the home. The fire pit was our high light every evening. Having king comfortable beds in every room was a plus. We would love to go back! Fantastic property with incredible views! The Stonecliff house was perfect for our two families with young children. It was so quiet the entire time, and we loved seeing the bald eagles over the property. We stayed for four nights, and loved using the hottub, taking in the views from in and out of the house, and cooking meals in the kitchen. The kitchen was well stocked, and the movies, puzzles, and games were a nice bonus. Getting to the house is a bit of a drive on an unpaved road, so it's a little tricky to get back at night. We thoroughly enjoyed our 4 days at Stonecliff. 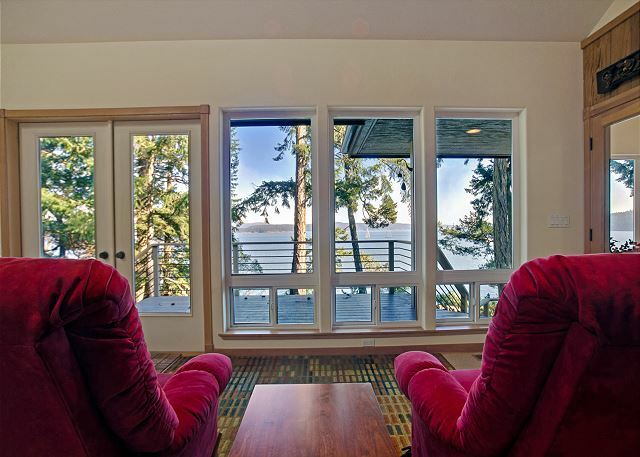 It is a beautiful, comfortable home with amazing views. In general, it was clean. There were a couple of things that should be noted. The upstairs bedroom had children's socks in one drawer and an opened package of cookies in another drawer. There was lint in the dryer and the pantry needed some attending to-open flour in plastic bags felt sticky. Some of the items should have been tossed. Pantry and kitchen drawers need some organizing. These did not detract from a wonderful time spent there but would improve the overall experience. We just completed a week on San Juan Island and rented "Stonecliff". It was a wonderful week and Stonecliff was a fantastic place to temporarily call home. 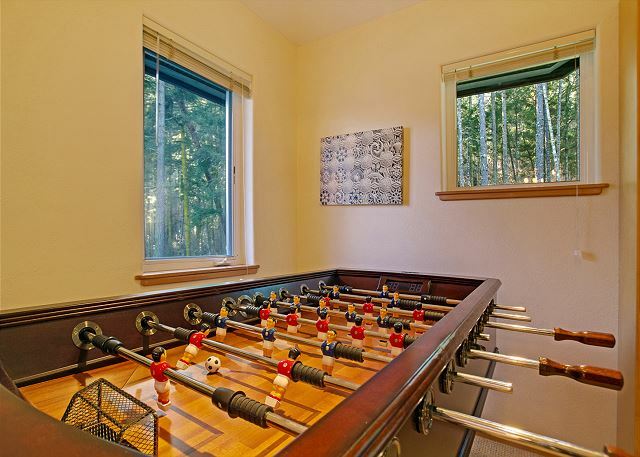 The property description was accurate in respect to location, layout and amenities. 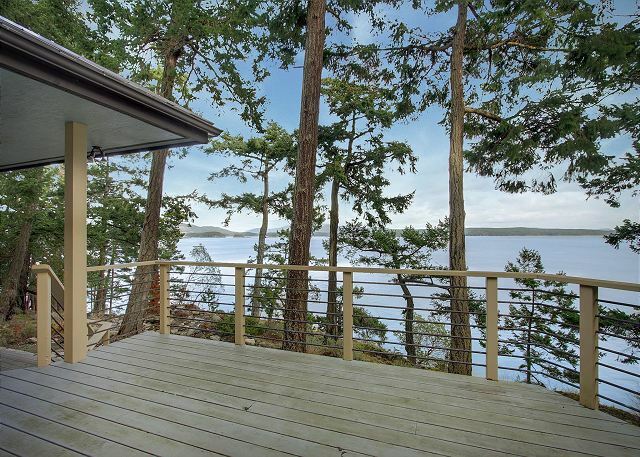 We spent most of our time on the deck with incredible views of the sound and Mount Baker. The house was very clean and the kitchen was perfect for our family of 6. 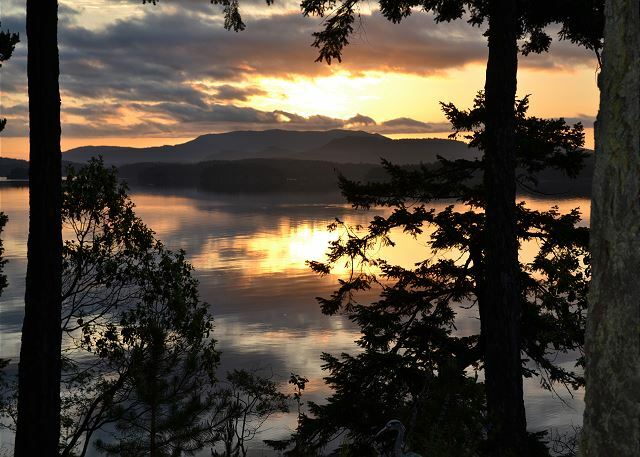 It is close to Friday Harbor and its shops and restaurants. We would enthusiastically recommend this property and would love to stay here again in the future. 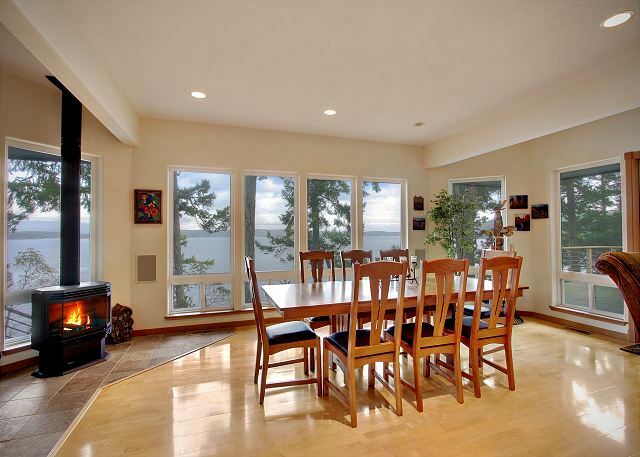 The Stonecliff property is large, well taken care of, has a great location and incredible views. What a phenomenal place to stay!!! We loved waking up every morning to the incredible views. ON a clear day you can see Mount Baker and everything in between. The property has a lot of land for the kids and adults to roam and play. The small beach area is filled with little tiny crabs that the kids loved to go see. There were deer on the property several different times and we saw seals out in the water right near the property. The house itself has three good sized rooms, big bathrooms and lots of room to have personal space. We used the hot tub, the fire pit, went on walks around the property and slept in beds more comfortable than the ones we have at home. 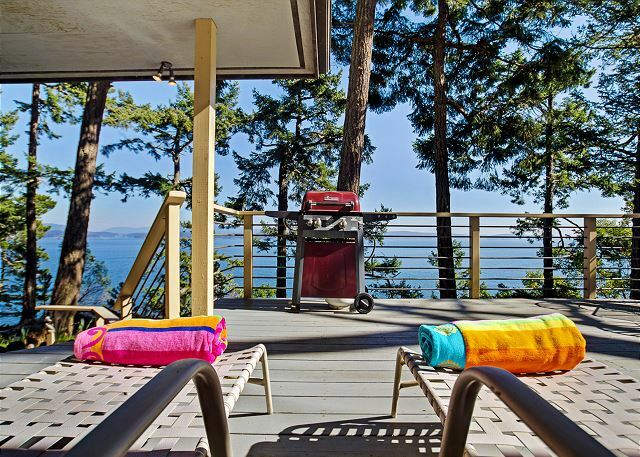 We would definitely recommend this property and may be reserving it again for a future vacation! Our families stay at Stonecliff was fabulous! The views were amaZing. The house was very clean and better than the pictures show. Beds and linens were very comfortable and the kitchen was well stocked we had everything we needed to make our family meals. We enjoyed the badminton court and just taking in the views from all the windows. All of the island was easy to access. No long drives to anywhere on the island. the island was so beautiful. We enjoyed kayaking, visiting Friday harbor and Roche Harbor and the lavender farm. Groceries are very expensive in town, next time we will buy before coming over on the ferry. We would love to stay again. We had a wonderful time. The property and your staff's services were excellent and cared for every detail making our stay very pleasant. My wife used to live off of Eureka Road with her parents, and our family visited this area for many years during holidays and other times, so this was a very special trip for us, made even better by this beautiful rental place. We appreciated the peace, quiet, privacy, views, hiking spots, well-equipped kitchen, plenty of indoor and outdoor spaces to enjoy, wild life, and responsiveness of staff. We definitely want to return as soon and as often as possible. The drive to the home was just beautiful and isolated. As we drove up to the house, the whole car was in awh:) they were giddy with excitement and how truly beautiful the views were. But that didn't end there, it continues when we enter this lovely home, very well situated on the cliff overlooking everything. The home was perfect, so we'll plan and spaced out. We never wanted to leave, even to go play, shop, or whale watch. We could have stayed there and never left the house. It will definitely be our first pick again to stay. Just truly a treasure. Thank you for letting us enjoy your home. We had a wonderful time at Stonecliff. The home was great. The weather was perfect. 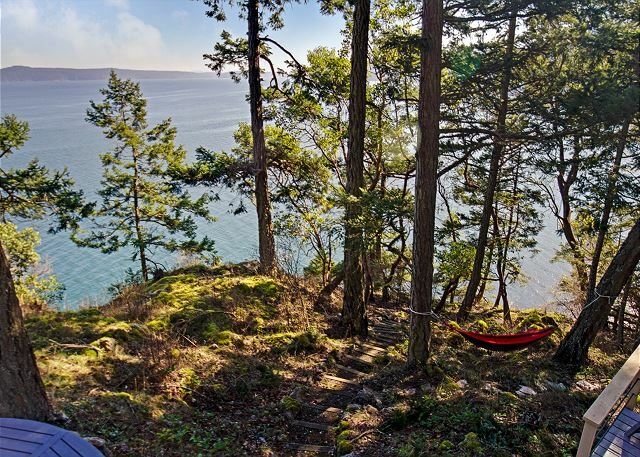 April was a wonderful time of year to be on San Juan Island. We had deer in the yard most days, eagles in the trees just outside of the house and a couple of days when the clouds cleared that we had beautiful views of Mount Baker. Very peaceful. This is an incredibly beautiful property! Be aware that it would not be great for small children as there is a 20 foot cliff down to the water in the back yard. The property is advertised with a hot tub but be aware that it costs extra to have it turned on. Overall, this was an amazing experience! A very enjoyable experience with my adult children. The house was clean and comfortable. We loved the location and the home. Absolutely beautiful in every way. We had a wonderful time at the house and on the island! The house itself is beautiful, nicely furnished and very roomy. We stayed with our adult children, their spouses and twin grandsons. The kitchen was well-equipped with cooking items. The bedrooms were roomy & comfortable. The deck and view were amazing. We had a fantastic experience and the house was perfect for our group. The rental company took care of getting us high chairs and pack & plays for the babies (for a nominal fee) which was very helpful to have them waiting for us. We've rented houses in Germany, Italy and in the U.S. so we've had many experiences for comparison. This house's rental price is on the high-end, but it was also very nice and clean. 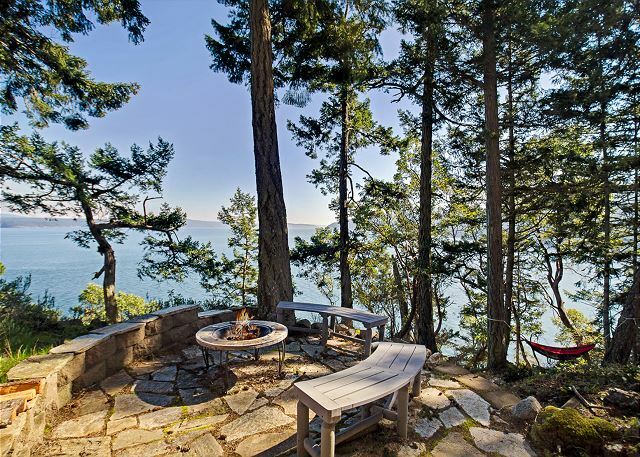 We highly recommend this property and the agency to anyone looking for vacation property on San Juan Island. Loved it! Perfect for our family. I would return. My family and my parents (7 people in all) spent 6 wonderful days at Stonecliff. We enjoyed exploring San Juan Island and all of it's amazing flora and fauna and especially loved our stay at Stonecliff. 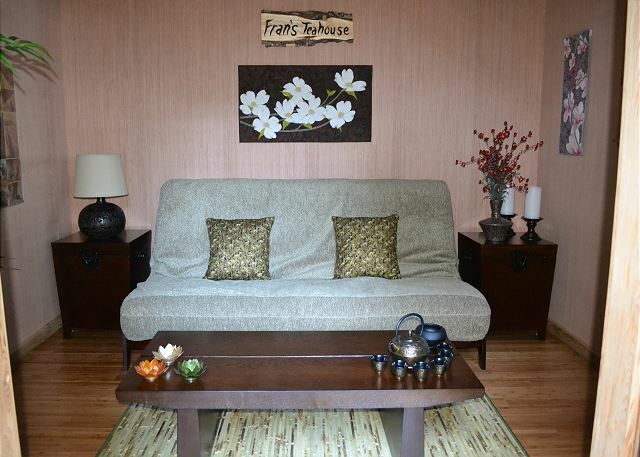 This beautiful home was spacious, comfortable and well equipped. 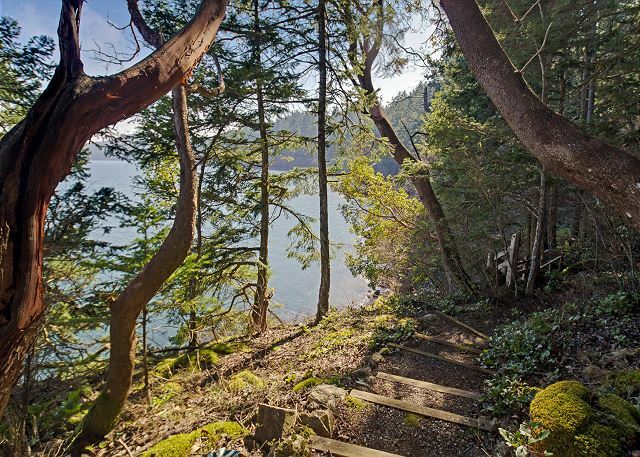 While it is just a short drive to Friday Harbor, the home is quite a distance off the road and sits on a heavily wooded, private lot with a beautiful rocky shoreline. The views from the home were truly unforgettable...we awoke each morning around 5 to simply watch the sun rise over Mt. Baker and often ended the day in the hot tub listening to the birds in the woods and on the shore. We saw seals and harbor porpoises off the shore as well as deer and many birds. We all had a great time and found ourselves both well rested and reluctant to leave at the end of our stay. 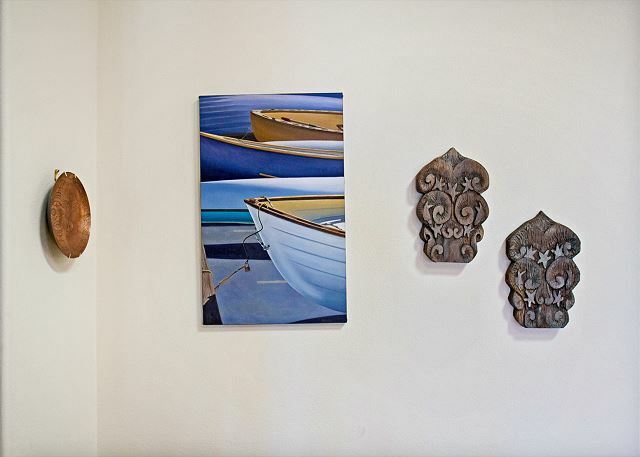 We would love to return to Stonecliff and SJI again and highly recommend the home to travelers seeking a serene, relaxing and beautiful home away from home! 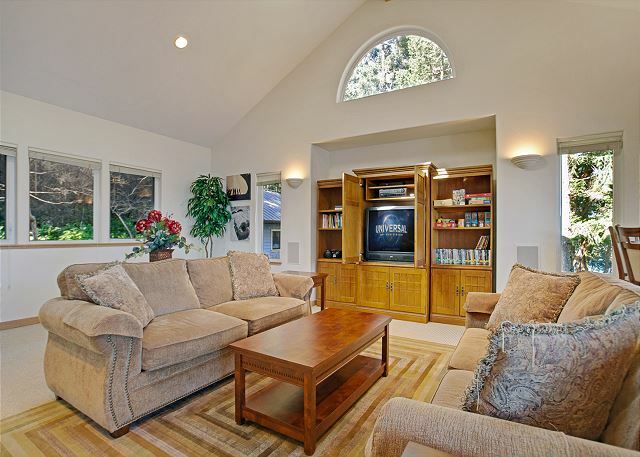 Immaculate, organized, beautifully but comfortably furnished & decorated spacious but private home with fabulous water & wooded views that anticipates your needs. However, I recommend the owner upgrade the master bathroom shower head to a more powerful sprayer or hand sprayer. The existing shower head needs updating. Overall, we were very satisfied with the home & it's location. 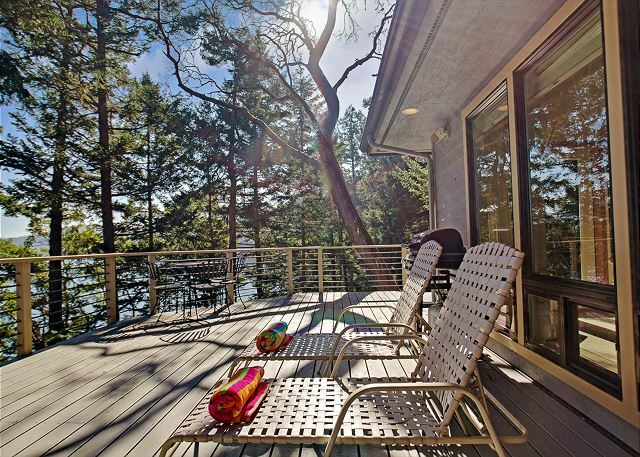 We are looking to return for a second visit to Friday Harbor and requesting this property again. The views out the backside of the house were incredible. The house was as shown on the web site. Management cleared us to use the hot tub, which was nice in the am and at night. Having are own car allowed us to travel around the island and to town. Had a wonderful time at Stonecliff. Lovely home in a lovely location. Highly recommend. My husband and I along with our adult sons and their special women spent the most wonderful weekend at Stonecliff. 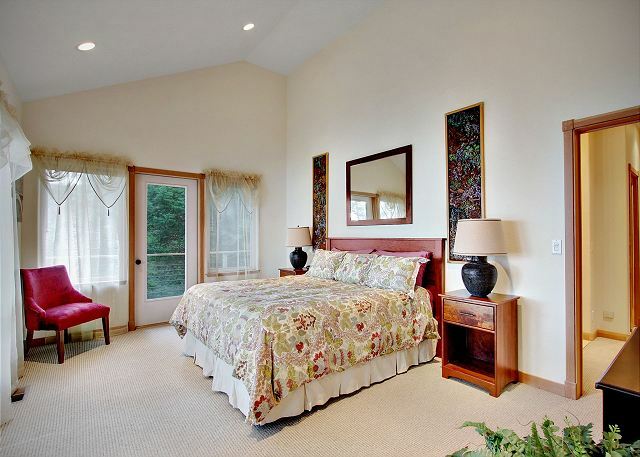 The three bedrooms with Queen or King beds in it were perfect for three adult couples. The third bathroom was a bonus. The layout of the property both inside and out was fantastic and everything was clean, comfortable and updated. The views were awesome. We loved our stay. What a wonderful relaxing getaway for family and friends to catch up. Spacious rooms and private spaces to get away from it all. 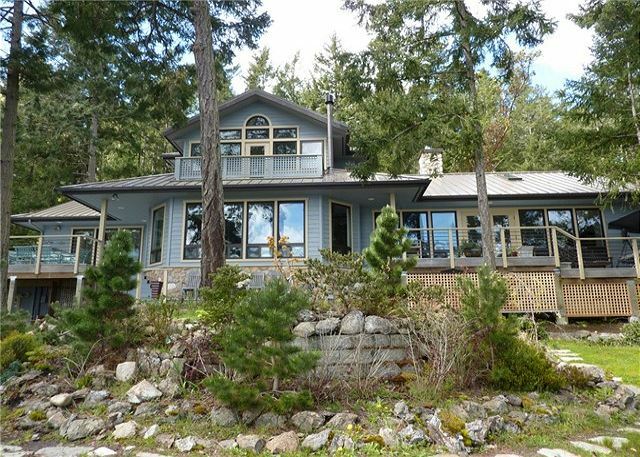 Terrific waterfront location - great for watching ferries and exploring the outdoors. Loved all the artwork in and out - we were constantly discovering new treasures. This was a great place for 5 adults to kick back and enjoy a fresh seafood from the local market after a day of exploring the area. An exceptional rental home in every sense of the word. It was a total joy to stay there including it being very quite and restful. 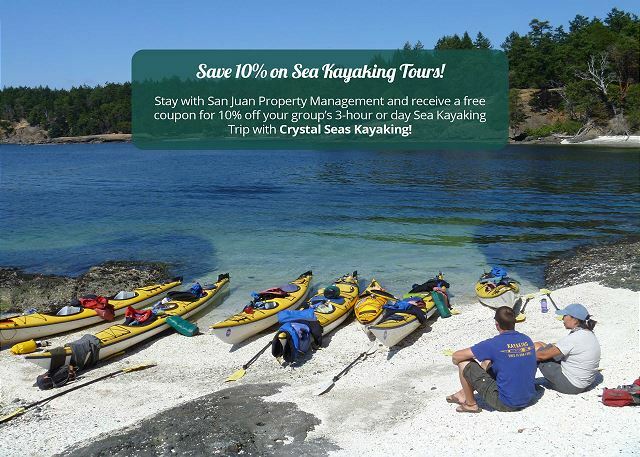 Easy to get to Friday Harbor for kayaking, whale watching, and many very good restaurants. 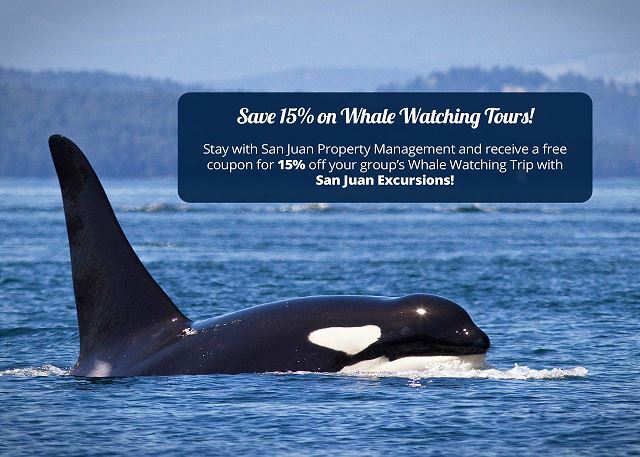 We were thrilled with our experience with San Juan Property Management and the property itself. It far exceeded any of our previous rental experiences and, in fact, extended our stay at the last minute because we were so reluctant to leave. Many thanks to the owners of the beautiful home and to San Juan PM...and of course the residents of San Juan Island itself. We had a wonderful time. The Stonecliff house was absolutely perfect!!! The house was immaculate, roomy and very well stocked with all the essentials. We would rent this home again in a heartbeat! Wonderful family gathering after a wedding in Canada. Beautiful views from spacious comfortable quiet home.The hot tub,hammock,fire pit and whimsical hiking trails were a bonus. Very clean with great beds. Everything as described,great location to explore from. There was no replacement lightbulb for the kitchen and there were no drapes on the upstairs bedroom. The lack of drapes meant that the sun came streaming in my eyes early in the a.m. Other than those two things the house was very nice. The drive to the house. . .what an experience to meet a neighbor! We loved the location and the island. We liked being out of the hubbub (relatively mild though anyway) of Friday Harbor but being close to both Friday and Roche Harbors was great! The home was the perfect size for 6 adults. The kitchen was well stocked with cooking supplies. The property is located in a secluded are with an amazing view. We watched balled eagles from the kitchen table and could see porpoises and harbor seals from the deck. We enjoyed using the outdoor fire pit at night. Property was as explained on line and more. Very clean, well appointed kitchen, beach towels....had everything we needed. We had all the comforts of home. You might want to add to the advertisement of Stonecliff that the deck faces east for those who may be interested in the breathtaking sunrise and moonrise. Hiking trail was spectacularly beautiful and manageable....even at 60. Renting this house made out stay on San Juan Island husband thought it was the best part of our trip to the NW. Property management does a complete and professional job. Outstanding in every way. See our TripAdvisor Review for details.